Protein Granola was designed by THE PROTEIN WORKS™ development team to not only taste great but also to have an impressive nutritional profile too. Made from a carefully measured combination of oats, whey protein isolate crisps, coconut oil, flaxseed and other nutrient dense ingredients. Super Berry is a perfect blend of red super berries including cranberries, goji berries and raspberries to give your Protein Granola a real fruity lift! Seving size: 50g portion recommended. We recommend 50g per serving. Protein granola can be enjoyed straight from the pot on its own or with other nutritious ingredients such as TPW zero syrups, greek yoghurt or unsweetened almond milk. Oats (gluten), isolated Soya protein, Super Berry Mix (Dried cranberries(cranberries, sugar, sunflower oil) Dried goji berries (Sulphar Dioxide) Dried raspberries) Honey, Whey protein isolate crisp (whey protein isolate (Milk), Rice flour, Emulsifier (Soya Lecithin)), Coconut oil, Oat protein, Apple juice concentrate, malted toasted oats(whole grain oat flakes, Malt extract (from barley), Palm oil) flaxseed. 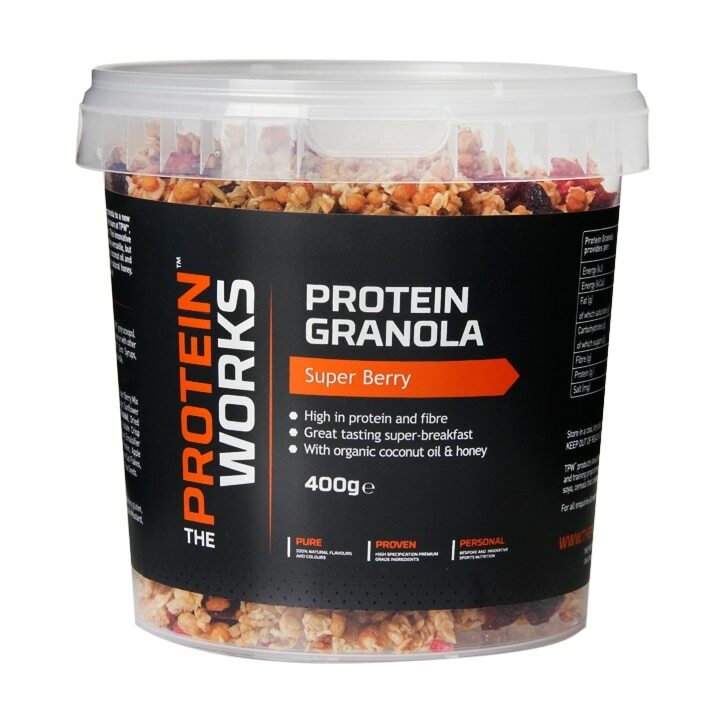 The Protein Works Protein Granola Super Berry is rated 4.5 out of 5 by 4. Rated 5 out of 5 by Savannah from healthy and tasty very healthy and tasty granola and on top of this it was on clearance. Rated 3 out of 5 by Trunk from Looks better than it tastes. When I first bought this product it look to be full of fruity bits and scrumptious. However, when I tasted it I was very disappointed. The product did not taste of anything, and did not have the usual granola crunch. Rated 5 out of 5 by Mel66 from Berry Happy This tastes yummy and great for lunch on the go! Gone are the eating cardboard days with this great tasting granola!